Olga de Schumacher was born on August 28, 1885, in St. Petersburg to parents of German-Lutheran ancestry. She said, "From an early age, I always had a religious feeling. "1 She lived a rich childhood supported by parents who, though aristocrats and her father a high-ranking official in the government, spent hours with their children playing chess, reading literature and philosophy, and attending numerous cultural events, including music recitals. As a young woman, attending a recital of Thomas de Hartmann's music, she met the composer at intermission and felt as though the two had long ago known one another. They were married in 1906 and Olga recounts, "The sister of the Tsar was present and the church was filled with Guards officers and high dignitaries." Thomas's music so impressed the Tsar that he was released from active duty in the military, instead assuming a reserve officer post, which allowed the couple to spend much of the time from 1908–1912 living abroad in Munich. Returning to Essentuki to acquire the necessary medical care for Thomas, the de Hartmanns were soon joined by Gurdjieff, many pupils from Moscow and St. Petersburg, as well as many of Gurdjieff's relatives escaping the Armenian genocide. This began an intense period of work. Of particular note was Mme de Hartmann's consternation when Gurdjieff declared that all the women would have to surrender all of their jewelry save their wedding band and watch. She found this excruciating, but when she finally gave him a box with all her jewels, he waited for her to almost leave the room. Then, calling her back, he instructed her to keep them. From Sochi the de Hartmanns traveled with Gurdjieff to Tiflis. Here they made the acquaintance of Alexandre and Jeanne de Salzmann, eventually introducing the couple to Gurdjieff. It was also at this time that they heard form Gurdjieff's brother that the White Army had confiscated their stored belongings in Tiflis. Having discovered that some of the property had belonged to an officer of the Guards (de Hartmann), they had given word that the owner could come claim their property. Realizing that a now healthy Thomas would be conscripted into the Army, Gurdjieff sent her on a solo mission to reclaim their property, as well as his remaining carpets in Essentuki. He gave her a small box containing a pill, to be taken should she run into insurmountable hardship. After a long and at times seemingly impossible journey, during which time she needed to draw upon all the resources that had been actualized within her by her Work with Gurdjieff, she arrived to her delighted husband and returned the box with the pill to Gurdjieff. After a brief relocation to Constantinople in 1920, passing through Berlin in August 1921, finally, in July 1922, the de Hartmanns left with Gurdjieff by train for Paris. Mme de Hartmann was sent to find a large property in the vicinity of the city. Finding the Chateau de Prieuré in Fontainebleau, she needed to convince the owner, Mme Labori, to not only agree to lease the property rather than sell it to them, but also to not leave a gardener there to report on the upkeep of the property. Gurdjieff instructed her to keep the thought in her mind that the gardener would be sent away, regardless of the conversation at hand. To Mme de Hartmann's surprise, Mme Labori voluntarily conceded this. In January 1924, the de Hartmanns accompanied Gurdjieff to America where they gave public demonstrations and attracted interest in the teaching. Performances in New York, Boston, Philadelphia and Chicago led to the founding of American groups. Pupils including A. R. Orage and Olgivanna Hinzenburg (later Lloyd Wright) remained in the U.S. when the de Hartmanns returned to France in April. It happened in the 123rd year after the creation of the World. So began the first of Gurdjieff's three series of writings, All and Everything. Mme de Hartmann had long been Gurdjieff's personal secretary. Now she became the scribe for a series of tales that A. R. Orage later described as on the level of scripture. The writing took place over six years, according to Gurdjieff's account (though she wrote that it was finished in November 1927).9 She also transcribed the Second Series, Meetings with Remarkable Men. Gurdjieff in 1929 convinced the de Hartmanns to leave the Prieuré and to settle closer to Paris. This he reportedly did as he realized that he was surrounded with pupils dedicated to his every comfort who would spare him the necessary difficulties of life. Returning from a second voyage to America with Gurdjieff, the couple settled in a house in Courbevoie, where her parents lived with them. The following February, Gurdjieff (preparing for another trip to New York) insisted that the de Hartmanns accompany him. Explaining that her husband was too ill and that she could not leave him, Gurdjieff demanded that they go with him or never see him again. She watched as Gurdjieff's train departed, knowing this was the last time they would see one another. Gurdjieff moved to Paris in 1933. Several times he sent to the de Hartmanns to request their return to him. Thomas in particular had an unshakable conviction that they were not to do so. They remained in continual contact with Mme de Salzmann, who phoned them in 1949 to summon them to Gurdjieff's bedside as he died. They arrived, but Gurdjieff was too ill for them to be admitted. He died the following morning on October 29 before the de Hartmanns could see him. His fateful words to her in 1930 had proved correct. Following Gurdjieff's death, the de Hartmanns moved to New York to assist the groups led by Lord John Pentland and they resumed their association with Mme Ouspensky in New Jersey. They also began a Work group in Toronto in 1953. 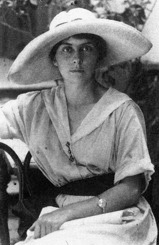 Thomas De Hartmann began to write an account of their time with Gurdjieff, with Mme de Hartmann interspersing her memories. He died in 1956 after which she continued to work tirelessly, finishing the book that was published in English in 1964 as Our Life with Mr. Gurdjieff. In 1992 the Definitive Edition was published, incorporating material from the original Russian manuscripts and her additions. Mme de Hartmann's memoir, "What For," is in typescript. She also organized groups in Montreal that grew into the Gurdjieff Foundation of Canada. Mme de Hartmann eventually moved to Santa Fe, New Mexico, for health reasons, where she died in 1979 at the age of 94. 1. Olga and Thomas de Hartmann. Our Life with Mr. Gurdjieff. ed., T.C. Daly and T.A.G. Daly (London: Arkana/Penguin Books, 1992), xxvii. 3. William Patrick Patterson. Struggle of the Magicians (Fairfax, CA: Arete Communications, 1998), 42.